Sugar Daddy: Regrettably, this cache was muggled. Moreso, I discovered that I just don't live close enough to this area to keep the cache well-maintained. for all you who found it while it was here, Congratulations! You are among the few! This decon container cache is in the Bog Garden in Greensboro, NC. Bring only small items to trade and your own pen. You do not have to crush or destroy existing flora to retrieve the cache. This cache is in the series I'm creating in honor of my favorite cartoon, "The Tick". Because this one is in the Bog Garden, I named it "Speak: The Furry Moist Avenger" because the Tick's faithful pet was discovered in a Mexican jungle/rain forest. 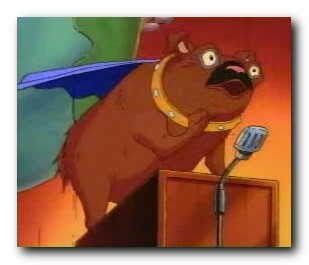 Speak is a capybara who becomes The Tick's pet. The first time they met, the Tick had fallen out of a plane, thousands of feet in the air, and crashed, head first, into a tree trunk. The Tick was delirious from the impact, imagining that this "dog" was talking to him (he spoke very articulately... in a fancy British accent, of course), which is why the Tick gave him the name, "Speak". The Tick is a little disappointed when he finds out that Speak is not a dog (and that he can't talk), but feels better when the vet tells him that Speak is a capybara, the world's largest rodent! The Tick then begins to try to train Speak to be a crime-fighting super-pet, but all Speak usually manages to do is drool and shed large clumps of fur due to his mange. Be sure to stop by and get Sir Fenwick's "Bog Garden" cache which is in the same garden. The view at his location is great, especially if you like waterfowl. Please respect the plants in the area and there should be no need to disturb them to get the cache. Since there are so many possible hiding spots, I've rated this a 2.5 difficulty. It took me some attempts before I felt good about the coordinates. Please post if you find ones that are better. For cachers with strollers, if you had the off-road kind with the larger tires, I think you'd be fine here. A normal stroller probably wouldn't be too bad, but I didn't look at the trail with that in mind last time I was there. Note: Currently, the cache says, "Sewer Urchin" on it, because I changed the name after I hid the cache yesterday. I think this name is more appropriate, and I'll change the name on the physical cache very soon.